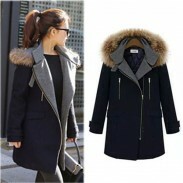 Slim False Pocket Long Sleeve Jacket Coat, simple and classic, in contrast color. 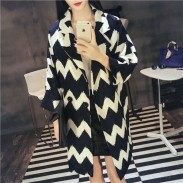 Slim False Pocket Long Sleeve Jacket Coat, simple and classic, in contrast color. Made of blended fabric, shape and color last long. Black and white, two colors for you to choose. False pocket style, very handsome, reveals woman unique charm. Can be worn as work suit or coat. Love it, just what I was hoping it would be. The quality and color looked good, but it was a little bit small. Have good quality, and it's very suitable for this weather.